Golden Bay is a beautiful area over the Takaka Hill at the northwest end of New Zealand's South Island and the Abel Tasman Park. 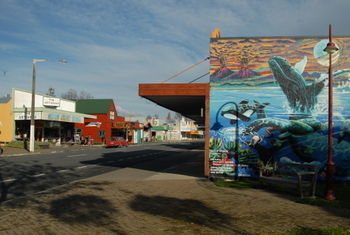 It has a friendly, welcoming feel and is great for a day trip from Motueka or as a destination in its own right. With beautiful lakes - visit the Kaihoka Lakes or the crystal clear waters of Waikoropupu (Pupu) Springs. Break your trip over the Takaka Hill by visiting the caves or do the Takaka Hill Circular walk - watch out for those sink holes. Caves, climbs, walking tracks, horse treks, lovely beaches, boutique beers, excellent food, great shopping on Takaka's High Street, artisans and crafts people, galleries, friendly people and great accommodations - you won't want to leave. There are many things to do while in Golden Bay. Visit the Wainui Falls towards Totaranui, past the Wainui Inlet. 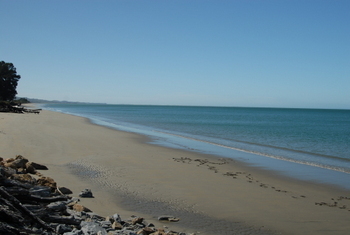 Go out to Farewell Spit, the Southern Hemisphere's longest sandspit with its long finger reaching out into the sea. It is unfortunately known for some of New Zealand's largest whale strandings. Separation Point is the boundary between Golden and Tasman Bays and is situated in the Abel Tasman. Or just take a wander into the Abel Tasman and enjoy the tracks and bays that this beautiful national park has to offer. 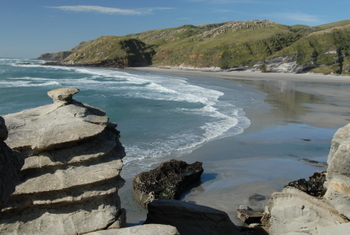 A trip to Golden Bay isn't complete without a visit to Wharariki Beach, a beautiful remote beach. At the right time of year the rock pools here are used as nursery pools for the New Zealand fur seal and you can spend hours just watching the young pups frolic. You'll also enjoy visiting the many artisans that live over the hill so ensure you have time to wander around some of the galleries. Takaka has all that you'll need if staying a while and Collingwood can certainly supply the basics. So take a trip over New Zealand's longest hill to Golden Bay and enjoy the top end of New Zealand's Abel Tasman National Park. The Rocks Chalets lovely private motel accommodation in Takaka, Golden Bay. Shady Rest Luxury Bed & Breakfast situated in Takaka, stay here and walk to Takaka's shops and cafés. Wild Cat Motels & Fishing Charters great motel accommodation in Pohara, Golden Bay. or Rainbow Community Backpackers and camping in Takaka, Golden Bay, stay in the backpackers, bring your van or pitch your tent on this lovely site near Takaka.